Here’s some health advice that shouldn’t be too hard to follow, as it involves eating a delicious breakfast food: whole-grain cereal. 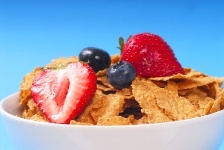 Why should you start your day by eating a bowl of cereal? Whole grains contain a number of special ingredients that could help lower the risk for some serious health problems such as heart disease and diabetes. — Arabinoxylan is one of the substances that make up soluble and insoluble dietary fibers. Dietary fiber has been clinically proven to exert various health benefits. Along with this ability, arabinoxylans are shown to have antioxidant activity, too. — Beta-glucans are complex carbohydrates that can help to boost your immune system. Some research also suggests that beta-glucans could provide a natural way to lower bad cholesterol, thereby helping to fend off heart disease. — Alkylresorcinols are phenolic lipids that can be found in the outer parts of rye and wheat kernels. In fact, these special phenols are pretty rare—other than wheat and rye, they’re only found in triticale, the fruit of Gingko biloba, one type of mollusk, and some species of bacteria. So, you’ll want to get these phenolic compounds from your morning cereal in order not to miss out on them! — Tocols, or tocopherols, found in wheat germ and other foods, function as excellent antioxidants, protecting your cells from damage. — Phytosterols are cholesterol-like molecules found in whole grains, fruits, legumes, and vegetables. All plants contain phytosterols, and although more than 40 types have been discovered, these three are the most common: beta-sitosterol, campesterol, and stigmasterol. Phytosterols, unlike animal cholesterol, stop or slow absorption of dietary cholesterol and cholesterol made by your liver, making them heart-healthy. Tomorrow morning, after you wake up, why not make a little whole-grain cereal on the stove? There are many healthy varieties now available in grocery stores that contain wheat, rye, oat, spelt, quinoa, millet, amaranth, and/or buckwheat grains. Add some blueberries and a spoonful of honey or maple syrup, and you’ve got a delicious breakfast that’s great for your health, too. Bartlomiej S et al., “Bioactive compounds in cereal grains – occurrence, structure, technological significance, nutritional benefits – a review,” Food Sci Technol Int. October 11, 2012.